Tim Johnson affirms the role of the artist in broad, spiritual terms. He has been influenced by both Asian art and Western Desert painting. His work speaks to us of hybrid identities. He is fascinated by other worlds, and it is not unusual to find UFOs, and elements from Japanese and Tibetan art in his paintings. 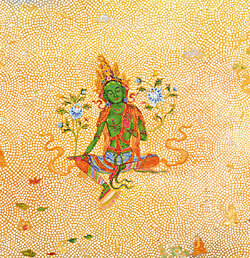 In Green Tara, Johnson uniquely marries images from Asian culture to images and motifs from Aboriginal culture so that here we see images of gold Buddhas floating over a field of dots. Johnson collaborated with Karma Phunstok who is a Tibetan living in Australia and who works as an artist producing contemporary Buddhist painting. Tim Johnson was born in Sydney in 1947 and studied at the University of New South Wales and the University of Sydney. In 1997-8 Tim received an Australia Council Fellowship and this, together with an impressive artistic career, makes him a key contemporary painter within the context of Australian Postmodern art. He has exhibited nationally and internationally during the last 18 years in public and commercial galleries and has held over 20 major solo exhibitions as well as participated in a minimum of 67 selected group exhibitions and national survey shows. He won The Redlands Westpac Art Prize in 1999.